Suppose you are developing an application on beaglebone black, and after the debugging process is finished, now if you want it as a stand alone product then it is not possible directly. Because every time to run your program (in whatever language: C, C++, Python), you were triggering it to run the program by logging in via ‘ssh’ or direct GUI. But this way is not feasible for the actual product. The actual device should start operating itself as per required application, when it boots. We cannot use Laptop/PC that time. So here there is a way by which you can enable your Beaglebone to run your actual program when it boots. So it directly starts your application. For example, you are creating a barcode reader device, then your beaglebone should be able to start accepting and processing data from barcode device directly right from the boot time. So this process is called assigning system startup services to beaglebone. Lets make a service which sends some string to serial port when beaglebone boots. 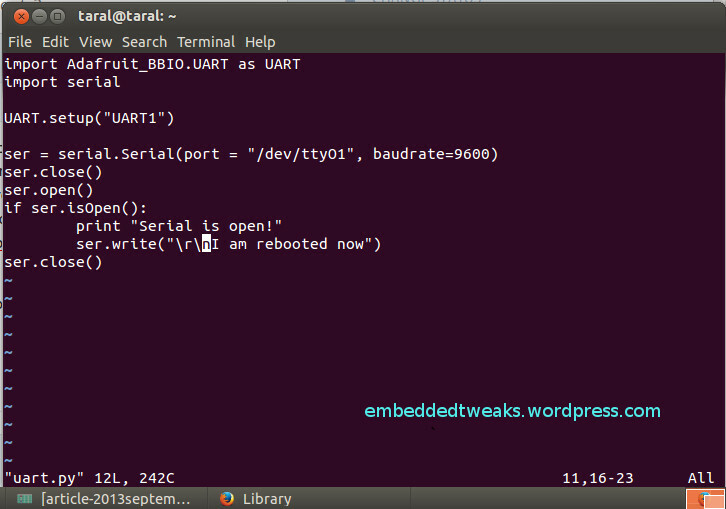 We will send “I am rebooted now” via UART1. Note: USB to ttl converter is required. 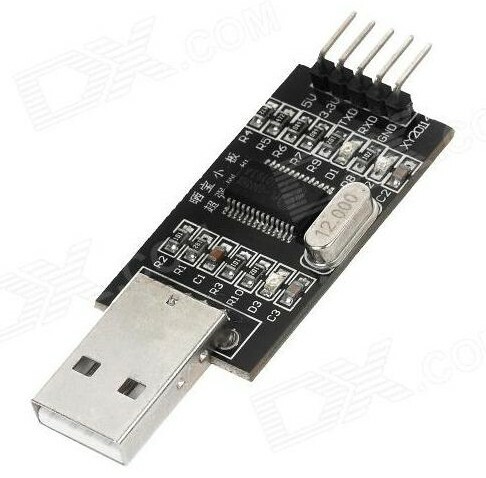 Take care, you must not connect its 5V pin on any GPIO pins of Beaglebone. Any type of devices such as PL2303, FTDI, CP2102 you can use. Now lets make a python script to perform our task first. 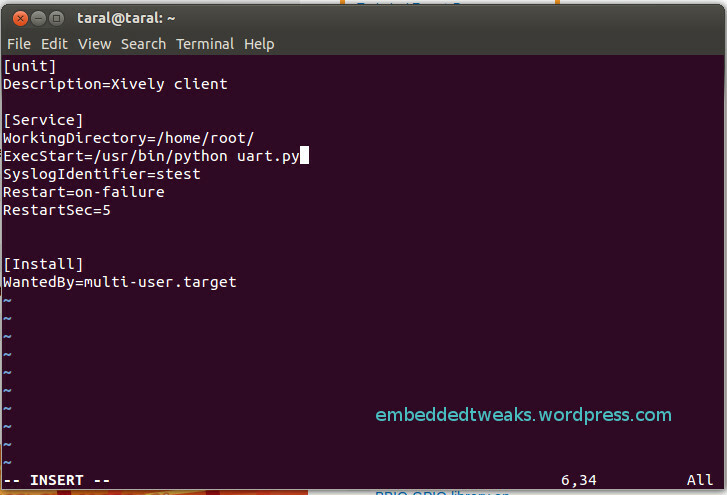 Make a program to send some string on serial port via UART1. Here’s the code shown below. Use vi editor for that. After typing in correctly press Esc key. 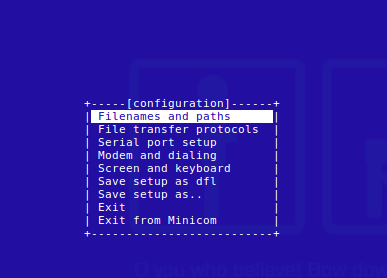 To check output , we will use Minicom serial terminal to see the incoming data. 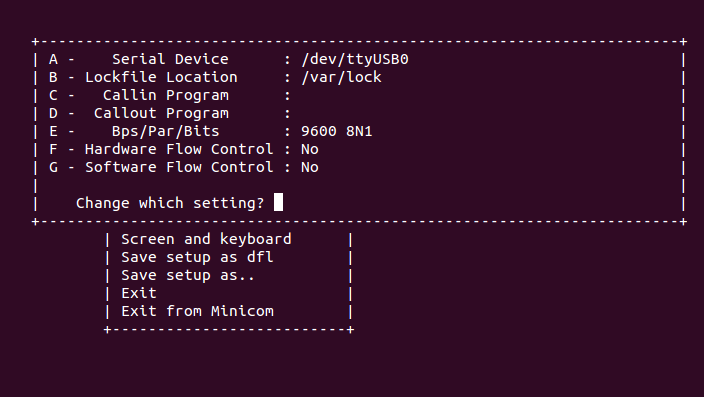 So lets go back to your Linux host and first setup minicom. Select Serial port setup. and change settings as following screen by navigation keys. Then save this settings as default and then exit. You should see the serial terminal window. Now lets test our code. Now, again run our python file then you should see the output as “I am rebooted now” in the minicom. Now we will make a service for this task. The steps are as following. Now reboot your device and it should send the string via serial port at the boot time within 10 seconds approx.